A chunk of paneer was sitting in the refrigerator crying out to be used. As to what to make with it was easy. 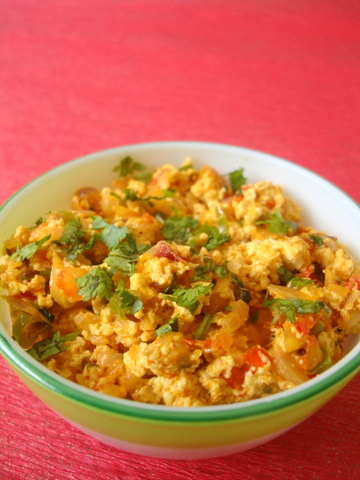 Paneer Bhurji. Quick to prepare which means less time in the kitchen on a hot summer day. The beauty of this scrambled protein rich dish is its simplicity. Flavorful and satisfying. Makes for a good side with roti or bread. 1 Heat oil in a vessel, add chopped onions and green chillis, saute till onions turn transparent. Add turmeric pwd, cumin pwd, coriander pwd, red chilli pwd and kasuri methi and combine. Add the chopped tomato and cook till they turn soft, approx 3-4 mts. 2 Add grated paneer and stir well to combine and cook for 2-3 mts. Add the low fat milk and toss the contents on medium high flame and see that the paneer does not stick to the vessel. The milk should evaporate. Add garam masala pwd and combine. 3 Finally, garnish with fresh coriander leaves and serve hot with rotis or bread. à°¥à°¾à°‚à°•à±à°¸à± à°¶à±ˆà°²à°œ, à°‡à°µà°¾à°³ à°ªà±Šà°¦à±à°¦à±à°¨ à°²à±€à°Ÿà°°à± à°ªà°¾à°²à± à°µà°¿à°°à°¿à°—à°¿à°ªà±‹à°¯à°¾à°¯à°¿. à°µà°¡à°•à°Ÿà±à°Ÿà°¿ à°ªà±†à°Ÿà±à°Ÿà°¾à°¨à±. à°¦à°¾à°¨à°¿à°¤à±‹ à°à°‚ à°šà±‡à°¦à±à°¦à°¾à°®à°¾ à°…à°¨à±à°•à±à°‚à°Ÿà±à°‚à°Ÿà±‡ à°®à°‚à°šà°¿ à°°à±†à°¸à°¿à°ªà±€ à°‡à°šà±à°šà°¾à°°à±. à°°à°¾à°¤à±à°°à°¿à°•à°¿ à°ˆ à°•à±‚à°° à°šà±‡à°¸à±‡à°¸à±à°¤à°¾à°¨à±.. I have tried so many of your recipes and have loved each and every one of them….specially the Andhra recipes. Thanks so much for blogging them! Can you blog andhra famous curry powders and also some powders like karam poddi that go well with rice ? I love your recipes! I have self taught my self Indian cooking ages ago and your blog has helped me improve so much. My boyfriend is from Vizag and he appreciates all the Andhra recipes I make thanks to you. Keep blogging! This sounds so good and easy too. I can’t get paneer here, but want to try making with crumbled tofu. Though I don’t like paneer, the pic tempts me to try this out sometime! Looks yummy! It was awesome!The next day stuffed in dosa and they were delicious 🙂 thanks. Thanks for the recipe. Turned out to be very good with tofu also. This a very nice recipe.I substituted paneer with tofu and mushroom coz, that was what I had at home…it turned out good. My husband thought it was egg burji and couldn’t find out untill I told him. I always make panner tikka, shahi panner because my son likes to eat panner today i saw this recepie and tried for lunch they really liked it. I tried this out today and it turned out excellent. Everything that I’ve tried from you have turned out well. Thanks so much Sailu! Pretty innovative to make Porutu out of Paneer! I had the same situation – a small block of paneer that I was wanting to use up and didn’t have the patience to cook elaborately. This recipe came to the rescue. Thank You! You must see this! This is such an interesting twist from Maggi! Hi Sailu, this recipe is so tempting..will try it soon. One quick question – is there a specific reason to add milk in this recipe ?